A SUPER blue moon lunar eclipse will turn the moon red this morning in a once-in-a-lifetime opportunity for skywatchers. Those who can’t see the eclipse in the night sky can watch the NASA live stream right here. NASA TV will be broadcasting the spectacular lunar eclipse online from 10.30am GMT (5.30am ET) today (Wednesday, January 31). The embedded video above will have telescopic footage from a number of NASA vantage points, including Armstrong Flight Research Center in Edwards, California, Griffith Observatory in Los Angeles, and the University of Arizona’s Mt Lemmon SkyCenter Observatory. Alternatively, Robotic telescope service Slooh will also be livecasting the spectacle from 10.45am GMT this morning (5.45am ET). Hosts for the show will be Slooh’s director Paul Cox, astronomer Helen Avery, Physicist Dr Paige Godfrey and astronomer Bob Berman. Wednesday’s eclipse is particularly special because it combines three separate lunar phenomenons - a supermoon, a blue moon and a blood moon. Viewers will watch as a blue moon - the second full moon in a calendar month - moves deep into the Earth’s umbral shadow. 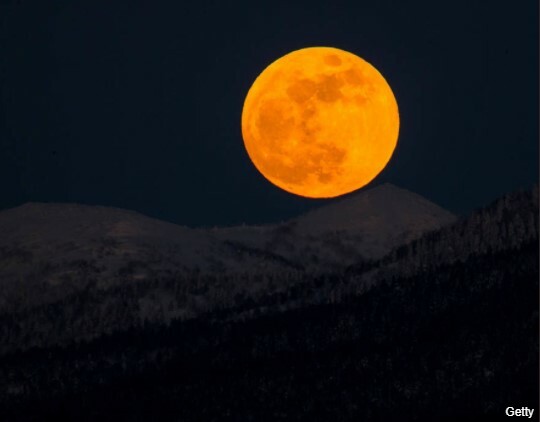 NASA has confirmed that the moon will whizz 223,068 miles from Earth, rather than the usual 238,855 miles, causing it to appear up to 14 percent bigger and 30 percent brighter in the night sky. As the moon ducks behind the Earth it will glow in a beautiful reddish hue due to a quirk of our planet’s atmosphere. The Royal Observatory in Greenwich said: “People sometimes refer to a lunar eclipse as a ‘blood moon’ because of the way the Moon can turn a deep coppery red colour during its eclipse. “However, the colour of the Moon during totality will depend on the global state of dust in the Earth’s atmosphere – sometimes red or possible virtually invisible. Supermoon 2018 in pictures: Rare super blue blood moon takes to the sky as three unusual lunar events - an extra big super moon, a blue moon and a total lunar eclipse - take place at the same time. This week’s eclipse promises to produce a “vibrant and ruddy hue”, according to Slooh. The super blue blood moon will mark the first of its kind to be visible in the United States since 1866, though other parts of the world were treated to a blue moon eclipse back in December 1982. 0 Response to "Eclipse 2018 live stream: WATCH the NASA Super Blue Blood Moon live stream here TODAY"